ECD Sensors have long life & easy replaceable electrode cartridges to cut down on maintenance time, cost and waste. There are unique field proven electrode formulations and designs for specific applications. ECD standard industrial products have design flexibility with materials and configurations for your specific installation requirements. 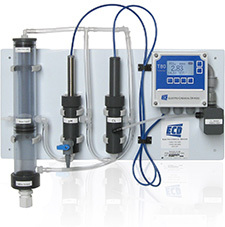 ECD products are offered as complete panel mounted products, stand alone batch analyzers, or transmitters with remote sensors. We are here to help you to solve your requirements with our ECD support team of Chemists, Application Engineers, Service and Customer Service Specialists, and our worldwide network of trained sales representatives with local field offices. Electro-Chemical Devices (ECD) is a manufacturer of liquid analytical process instrumentation. Founded in 1977, ECD has built its industry leading reputation by its commitment to our customers through this basic approach: Provide quality products, develop technical innovations and provide responsive, knowledgeable service. Founded in 1977, ECD has been in business for over 40 years and has built its industry leading reputation by its commitment to customers within the most demanding applications and industries. ECD seeks talented and enthusiastic individuals to join our team of innovative and dedicated employees. We accept applications / resumes only when a job opening is posted. CLICK HERE to learn more! Our products are field proven, designed, and manufactured for demanding industrial applications.